I wanted to do another Holiday manicure, but my cuticles are so busted up right now from being neglected that I decided to do my Mom's nails. The entire manicure was supposed to be Silver and Gold themed (anyone automatically start singing the song?! 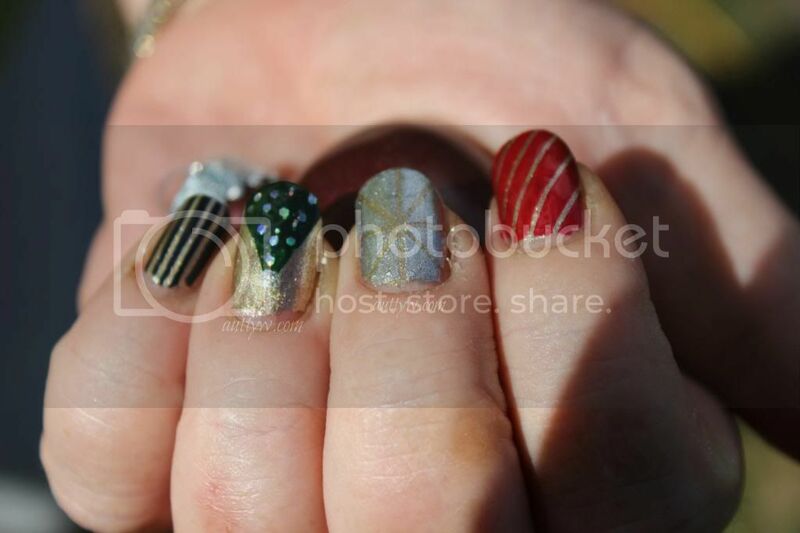 ), but alas after I did the first nail, I decided to do a Christmas Tree on the ring finger, then Mom suggested using red, then after that she suggested using the dark blue I had as well. LOL. 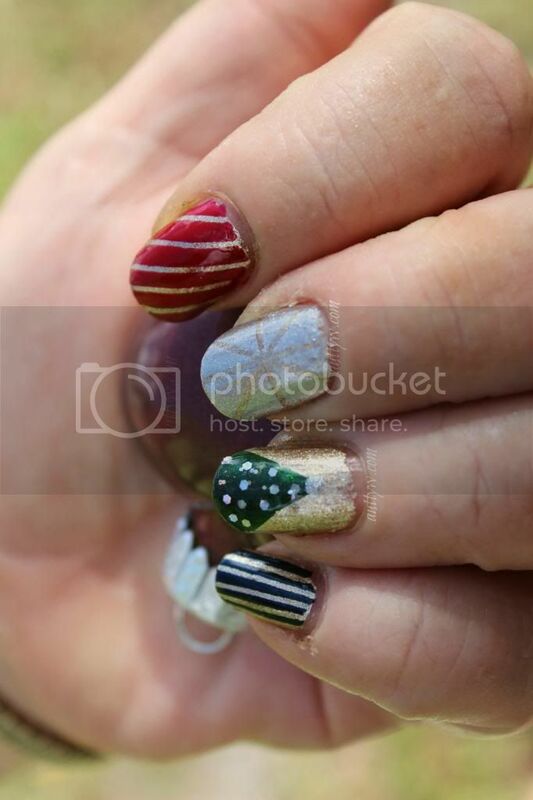 So this turned into a totally random mani! Oh! I also want to mention, please bear with me on mani pictures. I'm still getting used to the new camera and the angles aren't quite right on 2/3 of the pictures, then the pinky is out of focus on another. Pft. I promise to get the hang of it soon! I really like how they all turned out actually. My Mom's nails have a LOT more surface to work with then mine do and at the same time it's easier to do "nail art" on someone else's nails then my own. 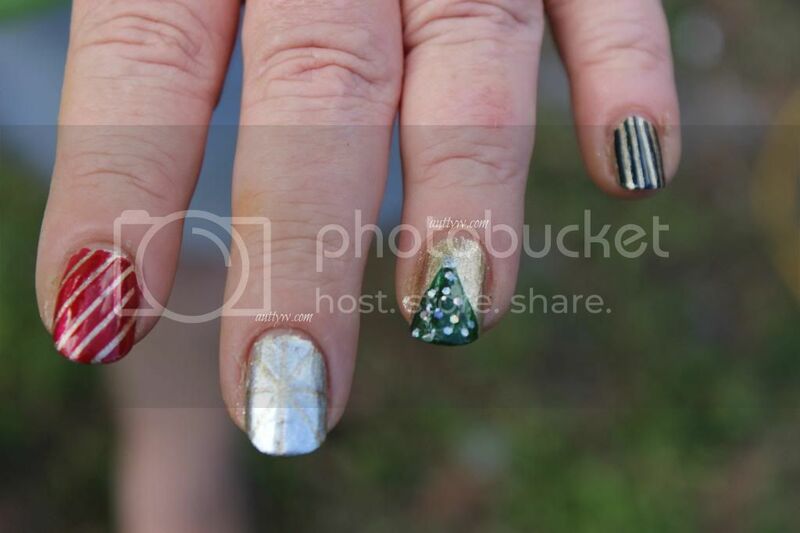 Are you tired of seeing holiday nail art yet?! :P I have a couple of reviews left to finish 2013, then I'm going to get on the ball and get tons of posts scheduled for the new year! Exciting right?! Glisten&Glow HK Girl Top coat was provided by G&G for review purposes. All opinions are my own, the other polishes I purchased with my own money. Thank you! xoxox I'm trying to branch out and try nail art.